and award winning interior design, the new HLB will feature a lineup of world famous DJs and performances, and much, much more! World Famous and reknown DJs rocks out Hip-Hop, EDM, house, top 40, old skool, mash-ups and more. 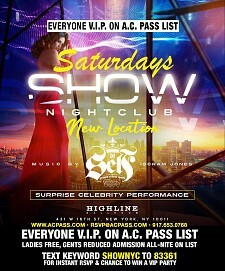 On the CRIS A.C. guest list, Ladies FREE til 12 am, reduced admission after & Gents are reduced admission before 2 am. Call me direct @ 917.653.0768 for Table Service, VIP Entry or more information. Dress to impress, fashionable & chic (No sneakers, torn jeans or baggy or casual attire please). 21+ID. For Cris A.C. List/VIP email me a CrisAC@Mac.com, call/text me anytime at 917.653.0768. Visit www.ACpass.com (for desktop/ mobile devices) NOW for Info/ Direction/ ACPASS Card.